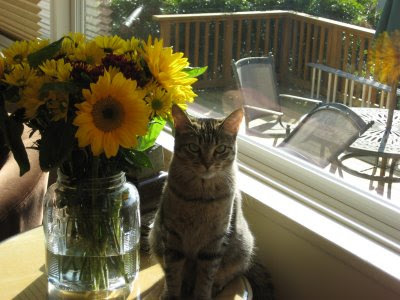 Update: Little Wilbur already found his forever home. I just got the call. Kinda sad, but happy that he is wanted and loved by someone! The local news is running a story now about this little tyke. 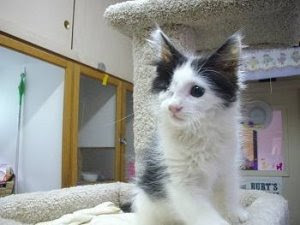 He is up for adoption after suffering a pellet gunshot to the eye. Let's not even talk about it, it makes me incredibly mad. But I think he's just perfect, and I think Kate will agree (fingers crossed). And so, if they call me back from the Helen Woodward Animal Center, perhaps Wilbur can come to his new forever home on Eagle Street! I'll keep you all posted! I have always loved reading the writings of women dedicated to the study of herbs and alternative medicines. Next to old stuff, antiques, etc., herbs are probably my second love. I get a regular email from Susun Weed (love that last name, huh?) with her "Weed Wanderings" writings, and today's update reported that a very well-known herbalist has "gone home." For some reason, she reminds me of Tasha Tudor -- maybe it is the simplicity and honesty of what she chose to focus on in her life. 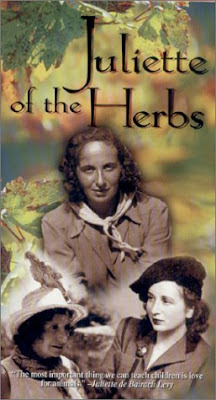 Juliette de Bairacli Levy is honored as the grandmother of modern American herbalism. She has devoted her life to the health and well being of domesticated animals, especially dogs. Her herbals and memoirs have been in print, and in use, for over fifty years. She passed away on May 28th, but will always be remembered. This image is actually the cover of a DVD about her life. To those who are no longer with us, and to those who are fighting around the world. While I never think war is the answer, it seems to be a reality in our society right now. I hope one day it is just an old idea from a time long ago. I took this picture yesterday, on our drive back from San Francisco. We stopped at the San Joaquin Valley National Cemetery to visit Mary's brother's grave site. There was a Memorial Day event taking place, and while we were there they did a 21-gun salute. It's good to remember those we love. Mary thinks they hear our prayers, and I think she is right. Oh, that Restoration Hardware! They come out with such cool things. The cart table really got my blood pumping, but then this mirror. 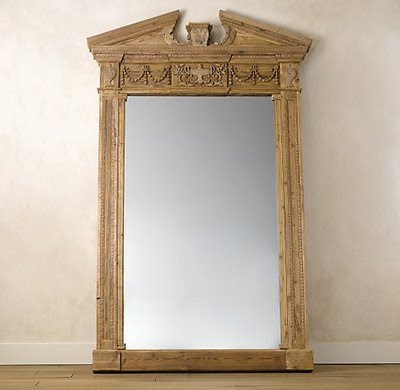 Again, so pricey, but we have no long-view mirror in the house anywhere (could this be why some of my outfits turn out the way they do...ha! ), and this one sure would be just the thing! I luuuuurrrrrrvvvvvvvv it. And I'm sooooooo not getting it. Found this on a rambling blog surf, here. I love the author Carol Shields. Her book The Stone Diaries was so great. I actually did not know she passed away, but apparently she took her step back in July '03. She wrote this snippet below, and I think it is a fine sentiment, don't you? It's especially good at times when you think maybe you're not getting enough done, or you could do better in some ways. Sometimes we just have to give ourselves a break and appreciate right where we are in the moment. Bake Sale Success - $835!!! OK, where the heck have I been? I think I went into a sort of half-sleep -- a blog fog -- only the hypnotist didn't ask me to count backwards from 10 to wake up. Whew! (shakes off sleep) I'm awake now, and have lots to update you on! First things, first. The bake sale! About 2 weeks ago (hm? 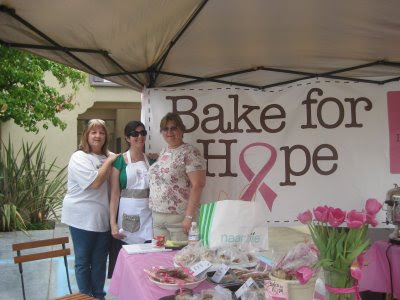 could be related...), I decided to join in and organize one of the Bake for Hope bake sales. Lo' and behold, 12 bakers stepped up to the plate, and their ovens! Not just any bakers, mind you, but AWESOME bakers. The likes of Sherri S. (and her lovely eco-chic wax paper bags decorated with millinery flowers), Ellen P., Lisa M., Justine A., Ginger, and others! Such amazing goodies. The table was so full -- full enough, in fact, that I wondered how in the world we would sell it all!!! But, sell we did: we made $835 that day...stayed open an extra 3 hours to make sure all the delectables found homes. We had quite a crowd, and such a rewarding event -- these funds help uninsured women pay for their cancer treatment. No one should have to be afraid they can't afford the medicine it takes to save their life. More pictures of the day are here! This past weekend, the Hardy men -- including sons and son-in-laws -- went up to the family cabin in Big Bear to make needed repairs. They went up Friday and worked until Sunday afternoon. We all share in the fun of using the cabin throughout the year, so it's only fair to put in a little sweat equity to keep things up to snuff. Yes, I'm talking a good talk here, since I didn't have to go! I'm pretty sure my skills are less suited to patching the ~700 woodpecker holes that were on the outside of the house and re-doing parts of the deck. So, the womenfolk stayed home. After all, there were barn sales to attend!! On Saturday, Mary (J. 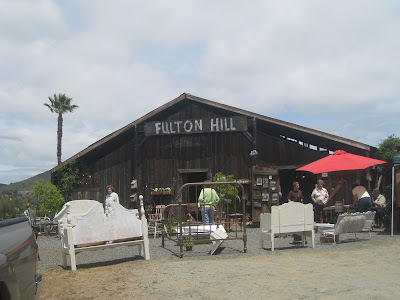 's Mom) and I went to the Fulton Barn Sale in San Marcos. 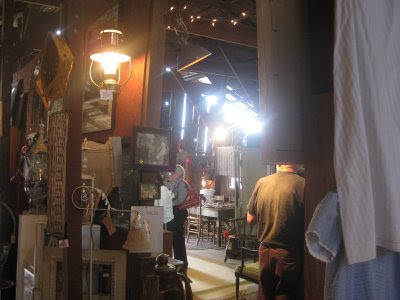 It was a 100+ year old barn built by Mr. Fulton, and it was full of goodies. I don't know him, but I loved his barn! I will admit, I don't think it was of the caliber of the barn that Stephanie found, but it was really fun and we came home with some treasures. The light was really neat inside the barn. People were milling through checking out the lovely things. I found some pretty nursery rhyme cards (always buying old paper! ), a gold locket that has the name Erma engraved on back (sweet), and a tea sieve. 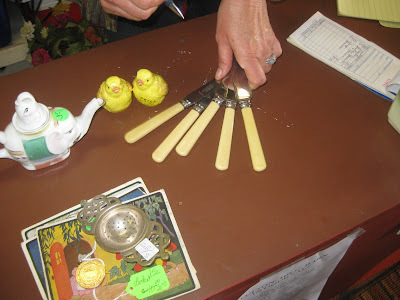 Mary got two bright yellow chicks, a set of knives, and a small elephant tea pot (we think it will make a nice creamer). She also got this neat black metal stroller that looks like it's from the turn of the century. It's going to hold a pot in her garden. We had a really nice day. 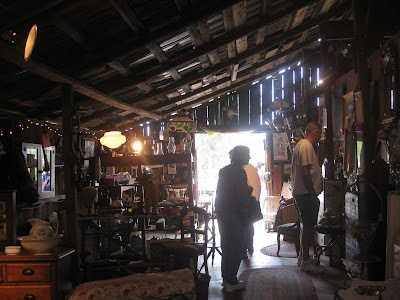 After the barn sale, we went to La Jolla for lunch and more browsing in a couple antique stores. It was a perfect Saturday. Sometimes when I'm out doing these things I wish I could magically transport some of the wonderful bloggers that I "know" through this whacky Internet world. I know you all would have had fun!! !